DOES: gives a child an opportunity to look closely and see things differently; great for trying to build creativity in a child. Once a reader asked me about Imaginets. I had nothing to say. I had heard of it. I knew it was a popular award-winning toy. But I didn't own it and when I saw it at the Toy Fair, I quickly passed by it because I was looking for the new stuff. Us toy reviewers only want to bring you the new stuff. We don't want to lose your attention. That is death by Internet. 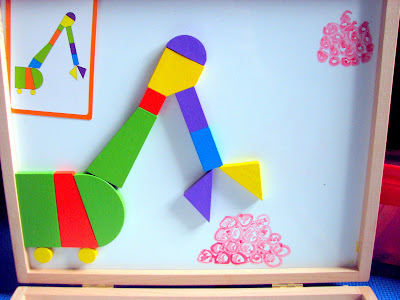 But I couldn't help it, I got curious and by then I had really fallen in love with magnetic toys and so I decided to take a look but of course, if it was an award winner, I would really have to get an expert opinion here. With any luck, we would be able to possibly uncover "new stuff" within this classic. 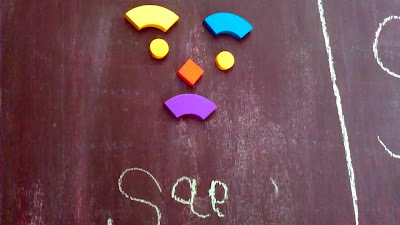 One day, I asked him how he was feeling and we used different shapes for the mouth and he told me he was sad. That last letter is his "d." But soon we made something together and he was happy again. 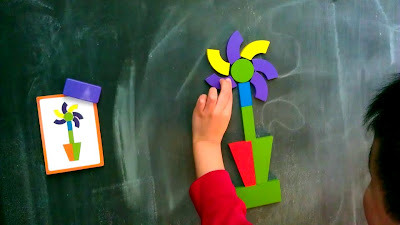 Imaginets asks the child to make a picture using differently shaped and colored wooden magnetic blocks. There are cards containing 50 different images to imitate. The level of difficulty increases with the number but they aren't really puzzles. There are no answer cards. You are just imitating with the blocks what you see on the cards. 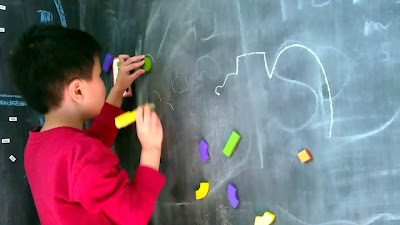 The work surface can also be used as a dry-erase board so that you could create your own story. It's all lovely but I wasn't sure if my kids, especially Number 2, would go for it. 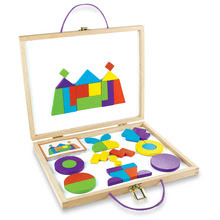 When he got the box, I gave him a card so that he could imitate the shape with the wooden blocks and he did it and then he walked away and did something completely unexpected. How bizarre! At the time, Number 2 was not big into drawing and the blank piece of paper was just too daunting for him but strangely, he just decided that he must start drawing right away. I'll never be able to figure that out but luckily I have Petra Pankow to help me. Petra is an arts educator who teaches in globally-recognized museums such as the Museum of Modern Art and the Guggenheim. I especially sought her advice as she has experience in having developed children's curriculum for the Museum of Art and Design. What she had to say was eye-opening. 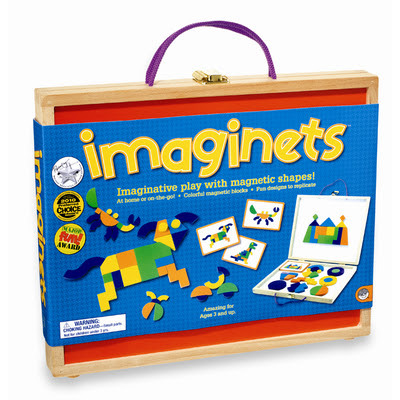 To Petra, and perhaps to many who have reviewed this, yes, Imaginets is about looking at shapes as combination of other shapes put together. Those shapes create a whole picture, a representation of something and that is all really great for kids but then she told me what I really couldn't see with my own non-artist-non-teacher eyes. "It's a certain celebration of funkiness," said Petra. Imaginets blocks are not your typical block set. Not only it is magnetic but they aren't meant to be stacked. It's all to show a 2D representation of something. But here is the big kicker. It's the shapes themselves that are funky. Yes, you have a circle and a square and a rectangle but you are have shapes that are not provided in what I would describe as typical. Some are L-shaped shapes, some are asymmetrical trapezoids, some are shaped like two mountains stuck together and there isn't a particular set number of blocks of that share common colors or shapes.(ie. You don't have four of each of everything.) For example, you only get two small squares and they are not even the same color. Petra pointed out that this flower's petals depicted an "interruption." That last petal on the right should be yellow you think? But it is not and there are no more such yellow pieces in that shape and she thinks that is how Imaginets celebrates funkiness. Dig Number 2's table? I didn't put it there. If you look at the color sequence of a lot of these pictures, you'll notice a sort of "interruption," as Petra described it. We all want order, we want the outline of the circle to be all of the same color. We want both semi circles to be the same color and an even number of green squares to make a picture symmetrical but with Imaginets, that is not what you get and that is essentially what I think is the best part about this toy. The message here: "Make do with what you have," says Petra. So is this toy asking a child not to be rigid - to make do with what he has to make his vision? "Absolutely, I think that is totally what’s going on," said Petra. Wow, and then it hit me. This is why art must be taught in school. We are always talking about save the art program in school and how it is so good for the kids. I say that too.... but I always thought that art was this very lovely time where kids are allowed to be creative but thanks to Imaginets, now I feel that art class is that one class that will help my kid's resume stand out from the others. If art class is about "interruptions" and "funkiness" and is asking children to "make do with what you have," then that must mean that art CHALLENGES children to think outside the box. And thinking outside of the box isn't going to just be something that is going to help him impress a future boss. I have a feeling that this kind of thinking will help him face problems that he will experience as he grows up. Some kids get overwhelmed and dislike having to find a particular piece in a crowd of pieces and so Imaginets is great in that one panel can be used to display your pieces (organized by color if you wish) and the other is the presentation space. We are lucky to have this large magnetic space to super-organize. If you are not convinced, think this way: When do we use creativity defined in an example? Look no further than a mom's life. Ever hear: "I found out just hours ago that they were coming over dinner and I had no time to go shopping, so I opened cabinets and grabbed this sauce and found chicken in the freezer and there were these frozen vegetables mixed with quinoa and I don't know what I did but everyone loved it and asked for the recipe." Look at magazines that list top ten richest people or top-ten grossing companies.. those stories are there. But who do they pick for person of the year? That person might not be part of the top ten anything or maybe not be on the list at all or if they are, they probably recently made it there. Why? Maybe because at the end of the day, we may remember that we are judged by not by what we produce but by what we produce with the resources we currently possess. 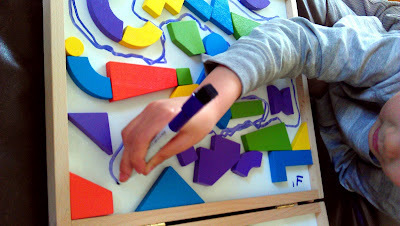 I really like how he is tracing the pieces to make something of his own. You can do that with Imaginets dry erase board too! Petra also said, "It's about perception as much as about production." She continued, "If you build something, you have to look closely." She also said this about Eeboo's The Drawing Book by Melissa Sweet. Petra believes that you can figure things out if you take the time to look. "I think that's what so many art educators would say is so fundamentally important in a society that is completely governed by images." Gosh, I do want my kids to look closely. I want them to see everything and be conscientious of what they are seeing as much as possible. I think Imaginets had done that for me too. Just a couple of weeks ago, I was passing by a very pretty subway ad by Uniqlo and I pointed it out to my son. I told him to take a look and remarked how stacking the socks up in such a colorful way made them look spectacular. Socks never looked so good and they were just socks. He agreed but then two weeks later, he noticed that different ads from Uniqlo were up and he started looking, really looking. I love that. This is the goal! Take the shapes and make them what you want. In the middle of the "car" there is a refrigerator magnet/ picture frame of Number 2 Son. I love the "exhaust" fumes. I think that is what it is. Petra stressed that looking closely is very important whether we do that by looking at a painting or by looking at shapes and figuring things out. "Then later on think about the social messages, photography and advertisement and you know that’s how the world goes around now, it’s all images." Clearly, the set up of blocks in Imaginets really does encourage us to think differently and I believe, to be able to see more. The "interruptions" they cause with the different shapes and atypical assortment of colors maybe causing "interruptions" to conventional thinking. But Imaginets offers 50 images of successful representations of something and they all look great. It's like you get used to looking at interruptions and they are no longer unconventional. They are just funky and cool and make you smile. Both of us wondered who could come up with such an idea. I can't stress enough how original this toy is!!!! My older son can use these to be creative too and he is way older than the starter age of 3. If you want it to, this toy can grow with you. Don't let that age 3+ tell you that you can't buy this for a five or six-year old. As you can see this card was not followed because it was not started in portrait position however, you can improvise and it can be totally okay. Don't Forget the Dry Erase Board! What is also great is that all the blocks and cards fit onto the magnetic insides of the box. It's perfect. You'll have to buy your own dry erase markers and I prefer that. I had bought my own set a long time ago that fit perfectly (and magnetically) into our Imaginets case. For Number 2, I just gave him a marker and he didn't draw a flower next to his beetle or a tree next to a bicycle and I was a little sad but then he surprised me. BIG! He used the blocks and arranged them in a way that looked like nothing but a mess and then he drew a line in between the blocks and told me it was a maze! That was so clever. I was really proud of him. He really likes mazes right now and the fact that he saw mazes in these blocks was very meaningful to me. I really think he's getting the message. These blocks can be used to become anything you want them to be. A child's imagination has no limits. None. At one point Number 2 just used the pieces to create a maze instead. That was classic! Curious about how your home state compares with others in the quality of arts education it offers? Check out this link from the Arts Education Partnership whose organization presented a summary (a.k.a. report card) called State of the States 2012. New York, my home state, received a score of 9. Can you guess what was the highest score? Which states received the best scores? Can't wait to see who wins Imaginets? Get your own set via my Amazon link. Additionally, these are the dry erase markers that I use. They have magnets on the caps and they fit in the Imaginets set perfectly. My kids keep pulling out the eraser. It drives me nuts. A Note: Toys are Tools has not been compensated in any fashion by the manufacturer or retailer of any of the mentioned products for the publication of this post. 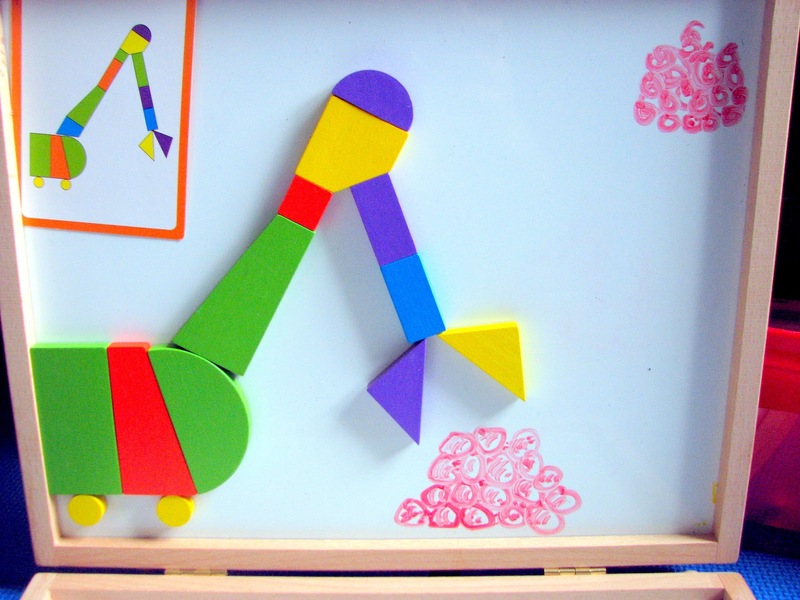 The product was given to Toys are Tools and to Petra Pankow to facilitate a review. Reviews are never promised. We would use them on the refrigerator. Thanks for your answer. 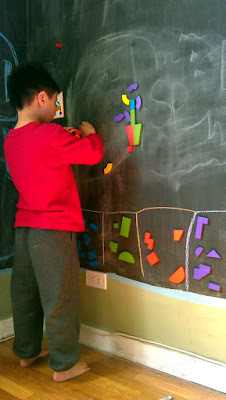 I know everyone doesn't have a magnetic chalkboard wall at home and so I'm curious if folks would move it out of the case. Mayla, Thanks for your comment! I totally understand. Oftentimes, mine stay in the case too! I would use them in the early literacy area of the library I work at. 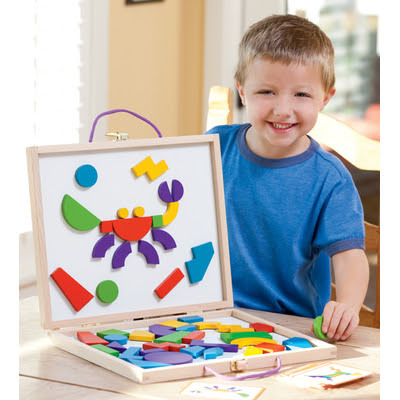 We would use the pieces on a whiteboard easel that we have but encourage the children to store the pieces in the case. I like that you can follow the cards like a puzzle or design your own pictures. How securely are the magnets attached to the shapes? One day, you will have to send us pictures of this awesome library of yours. The kids must have so much fun! How do they ever stay quiet? Anyway, the quality of Imaginets is awesome. One whole sheet of magnet covers the entire back, no matter what the size is. I hope this picture comes out. It should say it all. This set looks very special. Thanks for sharing. You find the most amazing toys! These are awesome! Jen S, That is amazing. Would love to see a photo of your wall! The entire wall? Up to the ceiling? Wow! I can see a 2 year old moving stuff around. Imaginets is so much fun to do while standing up! You'll love it! Really cool. I need some of these for sure. I think I kind of want to play with this... :). Looks like a good toy for on the go as long as I can keep from loosing pieces. Actually, I'm thinking this is ideal for going away for a week during the summer break. And if you lose a piece, I feel like it's going to be okay since the whole point it probably to be able to improvise and make your own stuff. So glad you decided to review these and not to get cuaght up with the "only new" stuff. They are fantasitc and your in depth take on them even more so.... Plus, I think you could well start hiring yourself out to design curriculm spaces/walls and activities for overbooked homeschoolers like me. I love these and cannot wait to try them out!! Love the use of the word "funk" in your post. Really gets at an idea and great play on language. 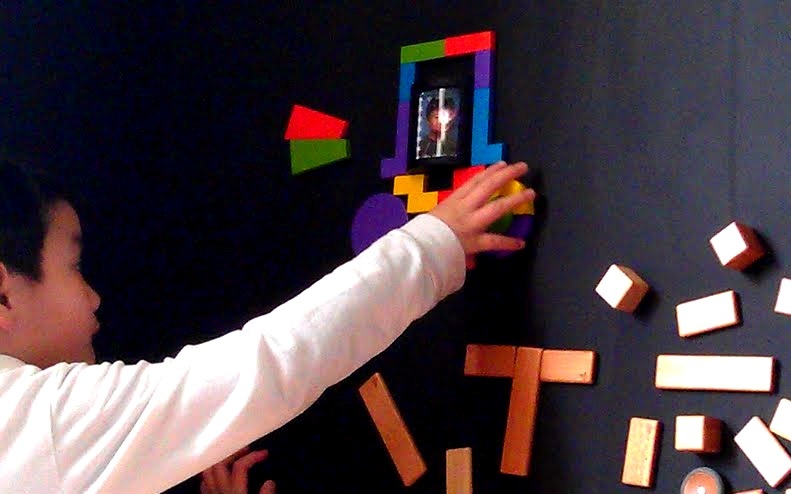 Looking at your photos, I am getting tempted to put up a magnetic wall in my house.